Art lovers were able to wander the Kunstroute (artists route) on April 6 and 7 of 2013 in the Statenkwartier, in which 52 artists were participating. 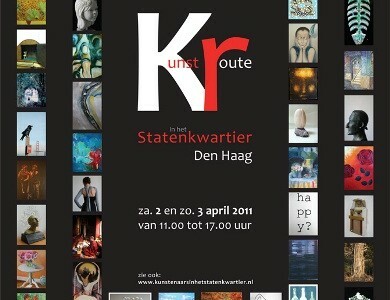 A wide variety of art was available to see at 39 locations in the homes or studios of the artists in the Statenkwartier. The primary goal is the meeting of the artist and the public. It has transpired that the public values interacting with the artists, gaining insight about her or his technique and hearing the story behind the artwork. People like to be drawn into the world of the artist, taste the artistic atmosphere and learn what inspires them. The ArtRoute has something for everyone: sculpture, drawing, painting, collages, installations, glass, photography, graphics, textiles, and jewellery. Should something capture your interest, you can buy directly from the artist. 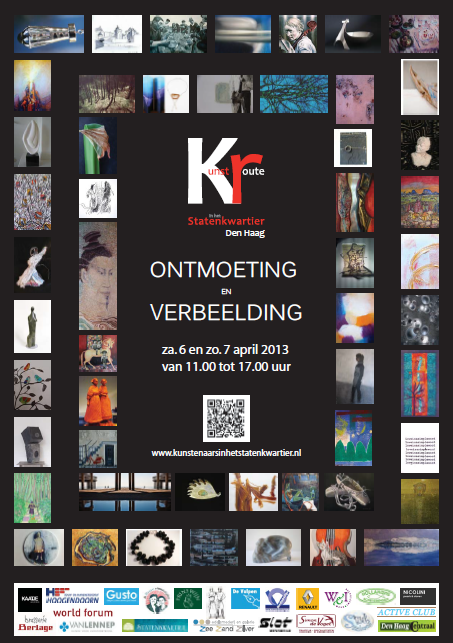 In the ‘Serre van Brasserie Berlage’ (President Kennedylaan 1) you can find a group exhibit of the participating artists. The locations of the participating artists in the ArtRoute are clearly marked through recognisable signboards. Both days you are welcome from 11.00 till 17.00 o’clock.